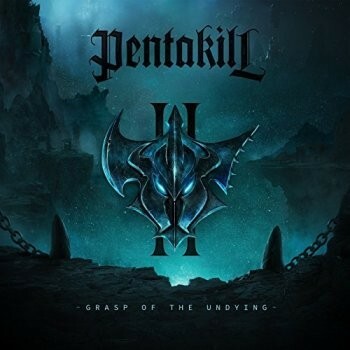 If they could scale up the music to match the story, Pentakill would be killer. Five harbingers of destruction patiently await their time to arise, changing your world for eternity with a sonic brutality that has already slain a dragon, butchered the baron, ravaged the fields of Justice, burned Runeterra to the ground and slaughtered millions. Their breed of Metal shall smite our souls and punish our bodies. These harbingers are Pentakill. Heavy Metal's answer to Gorillaz, Pentakill are a virtual Heavy Metal band – trading in traditional Power Metal with slabs of Symphonic, Thrash and NWOBHM thrown in for good measure – taken from the Multiplayer Online Battle Arena franchise League Of Legends. Yes, that's right, Pentakill are technically characters in a video game brought to life. 'II: Grasp Of The Undying' is their second album, and whilst its worthy of the title of not falling to the trappings of a crossover band, it falls far too short of their own promises; let's be honest, what Power Metal band ever truly punished our bodies, that's Slayer's job, right? For a band with a backstory as fantastical, as flamboyant and as fiery as theirs, they often or not feel a little oversold and underwhelming. Opener 'Cull' (with vocals from Jørn Lande) chucks out the acoustic guitars early on before exploding into some good old Thrash-tinged, riff-chugging Power Metal. Whilst the likes of 'Dead Man's Plate' and 'Rapid Firecannon' fill our world with lore of their own, they also feel a little too "been there, done that, got the t-shirt", something that feels a little too ironic, all things considered. The album's finer moments come when they switch it up entirely; from all-out harrowing, hallowing and haunting female vocals on 'Tear Of The Goddess' (featuring Battle Beast's Noora Louhimo on vocals), to the Nine Inch Nail-aping Electro mine-field that is 'The Hex Core Mk-2' and the grand finale, the seven-minute epic-slayer 'Blade Of The Ruined King' which feels like you're in the game, journeying on. As someone who's spent considerable hours holed away in my room playing games, I was underwhelmed by the execution of what, for me, was one of the greatest pitches for a band, and an album, I've ever heard. 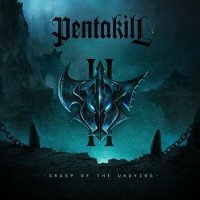 If they could scale up the music to match the story, Pentakill would be killer.